In the Italian region of Puglia you can find traditional historic houses, trulli, characteristic of the region. These cute and colorful ceramic bottles feature these local trulli; The DeCarlo family is making award-winning olive oils for decades and developed these bottles as a tribute to the famous little houses. These ceramic bottles come in 3 colors (blue, orange, or olive); they are 7 inches tall and can be refilled, so you can use this bottle for a long time. The color you receive will be chosen at random. These are lovely gifts and hold one of DeCarlo's 'il classico' extra virgin olive oil. Made from Ogliarola and Coratina olives, harvested straight from the tree and processed within 24 hours. 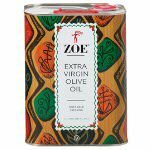 These olives are known to be rich and fruity and they produced excellent oil with a subtle soft and balanced flavor, characterized by hints of fresh grass and an aftertaste of sweet almonds. 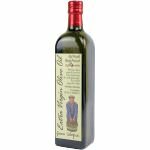 You can use this EVOO in the kitchen to add flavor to all kinds of dishes without altering the particular characteristics of the raw ingredients used. 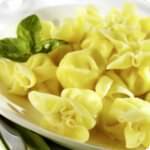 Ideal with boiled or baked fish, fried seafood, sauces and roast meats.